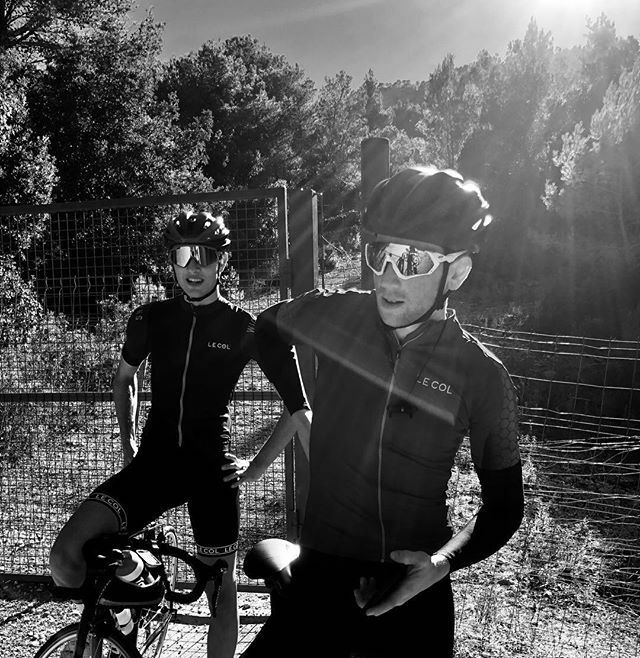 With the general health of the house starting to improve, we upped the volume a little for the next few days to start making the most of the climbs before a cafe run on Friday (when you will be reading this), and the final day of riding on Saturday. The fitness may have not been high, but the moral certainly was! Unfortunately due to unforeseen injuries it was just me and Lawrence on the ride today. Neither of us were ready to ride hard or do any big efforts, but we could ride at a solid tempo and hack round 4hrs with a fair few big climbs. None were road hard, but the sensations were not bad. The last few days I’ve just been riding to how the legs feel, rather than staring down at the power meter and it has certainly been more fun. Much more time to take in the surroundings. And trust me. Here, that means you see some outrageous scenes. We found what has to be the most amazing road I have ever witnessed. It started with a quality climb. Wide roads, smooth tarmac and a constant gradient, with big drops backed by great views. That led onto a winding descent which opened out onto a long road (see the video below if you don’t believe me!) with the sight of the mountains ahead and the sea far off to the left. Truly inspiring. This week has really got me away from where I was and into a better mindset to take home with me. Training will be high volume from now until Calpe in January and I have a long way to go until then! With everyone feeling well enough to hit the high mountains, we got up bright and early and set off! Just over 130km planned with around 3,100metres of climbing, taking in the climbs of Soller, Puig Major and Sa Colabra. Puig Major being the longest climb I had ever done at 14.9km. I had a few little efforts to do, but with the current condition I wasn’t pushing beyond the middle of z3, so nothing major. We crested the climb in 53 something minutes, riding at a comfortable but reasonable pace. Nothing on the 34minutes Team Sky did it in earlier this year! Then started the stunning but short descent before the final rise up to the top of Sa Colabra, where possibly the best descent I have ever ridden started. The smooth, grippy roads and sweeping bends made for a lot of fun even knowing there was only one way back up. Grabbing the worlds most expensive fanta, €4.25 you havin’ a laugh, at the bottom along with a quick photo shoot and it was time to head back up the last climb of the day. I decided to ditch the efforts and just ride the whole climb at mid z3 with some attempts of raising the power slightly in the last few km’s. This seems to work fine, my body can cope with that right now, but I don’t want to push it any further. It did insure a bonk though. So cafe was in order before the final 40km home. Saved by a sandwich. Not for the first time. Thankfully it was all downhill then flat. We got a fair pace on and carried it all the way to town. Five hours down. BOSH. Job done. Next Post Majorca 2k17 – The Final.